An exciting project about reconnecting with nature and bringing it back into our city. The fantastic Glasgow Wildlife Garden Festival map and events leaflet has arrived and can now be found in shops, pubs, libraries, cafes and schools across Glasgow. We are all incredibly excited! Kelvingrove Art Gallery and Museum welcomes Dippy the Dinosaur! Welcome to Giving Nature a Home in Glasgow! Glasgow Wildlife Garden Festival Competition! There’s not long to go until the Glasgow Wildlife Garden Festival 2014, and we need your help to spread the word! My name is Hannah Grist, and I am a Lifelong Learning Officer based at the South and West Scotland Regional Office in Glasgow. Hi, my name is Laura, and I'm an RSPB volunteer. 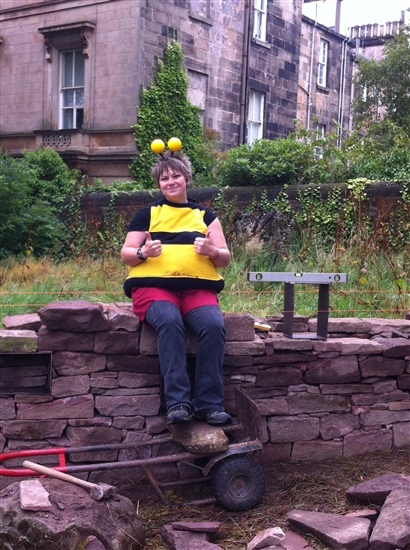 Why were bees and flowers cycling around Glasgow? Hi, I'm Laura Moss, the Lifelong Learning Manager for RSPB South West Scotland and Regional Office. The Glasgow Wildlife Garden Festival is back...and bigger than before! Join in with the great Glasgow bioblitz! Full schedule for Sunday's bioblitz in Kelvingrove Park!